Measure carefully, placing all ingredients except cream cheese, 1 1/2 tablespoons flour, the preserves, beaten egg and almonds in bread machine pan in the order recommended by the manufacturer. Select Dough/Manual cycle. Do not use Delay cycle. Remove dough from pan, using lightly floured hands. Cover and let rest 10 minutes on lightly floured surface. Mix cream cheese and 1 1/2 tablespoons flour. Grease round pan, 9x1 1/2 inches. Roll dough into 15-inch circle. Place in pan, letting side of dough hang over edge of pan. 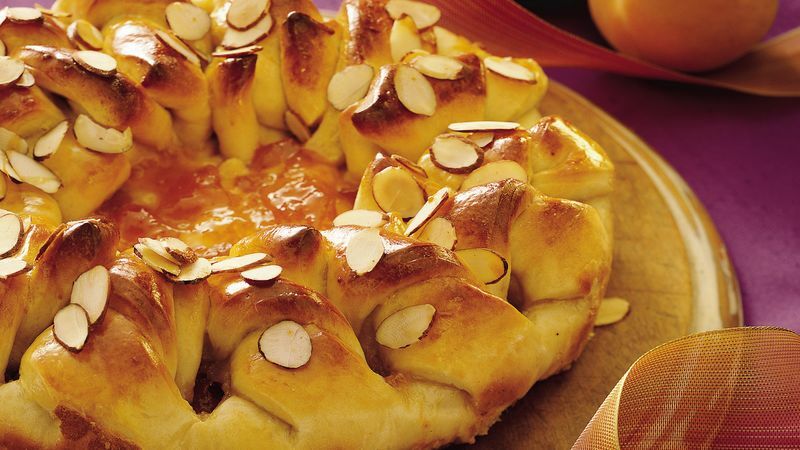 Spread cream cheese mixture over dough in pan; spoon preserves over cream cheese. Make cuts along edge of dough at 1-inch intervals to about 1/2 inch above cream cheese. Twist pairs of dough strips and fold over cream cheese. Cover and let rise in warm place 40 to 50 minutes or until almost double. Heat oven to 375°F. Brush beaten egg over dough. Sprinkle with almonds. Bake 30 to 35 minutes or until golden brown. Cool at least 30 minutes before cutting. Use kitchen scissors dipped in flour or sprayed with cooking spray to cut dough at 1-inch intervals. Raspberry preserves makes a flavorful stand-in for the apricot preserves.